It seems there couldn’t be a better time for Arsenal to host Sporting at the Emirates Stadium for the Europa League this week. After beating the Lions 1-0 in Lisbon, the Gunners will now see their opponents making the trip to London in a very different situation. It all starts with the manager. 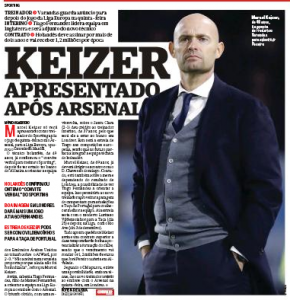 José Peseiro was sacked at the end of last week, and although the Portuguese media reports a deal for manager Marcel Keizer, he should only be presented after the match against Arsenal, according to Correio da Manhã. Meanwhile, the team will be managed by Tiago Fernandes, who normally works at the club’s academy. Now besides the manager, Sporting also have issues with injuries. 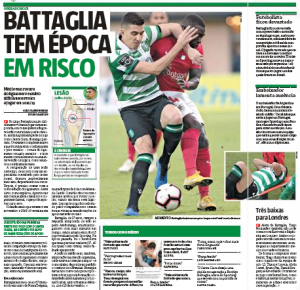 This weekend, they’ve lost Rodrigo Battaglia to a ligament issue, and as reported by Record, he could be missing for the rest of the season.. The midfielder had started all the Portuguese League and Europa League games he was available this season, and will surely be a big blow for the Lions. Fullback Stefan Ristovski and winger Rafinha are also ruled out, the newspaper says. They both had been featuring regularly for the club this season, and to replace all these guys in training Tiago Fernandes is calling academy players to work with the team.